When police fired on protestors on strike at an African Minerals Limited (AML) site in Bumbuna in April there was little mention of it in Sierra Leone’s local print press. 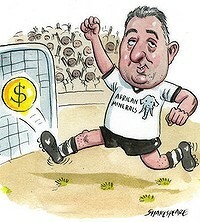 But this week the press is singing the praises of African Minerals and its boss Frank Timis. Either the reporters are really happy for the employees at AML or they are doing overtime for those highly coveted AML paid for advertorials. The controversial billionaire has announced that it will increase the wages of its lowest paid employees by a whopping 350 percent. Timis said that the company’s minimum monthly wage of 300,000 leones ($72) will be raised to 1,000,000 leones ($240). This increment will be adjusted for inflation and back dated to January 1st 2012. In addition to this Timis committed to an all round 16 percent increase in all staff salaries. In the print stories on the salary increases there was no mention of strike in Bumbuna, the injured or the dead. Da ooman im life don go buffin. Business as usual with Sierra Leone’s print press money trumps truth and objectivity. May the coco-ebeh selling continue. In other news, AML stock took a 6 percent dive in the London Stock Exchange last week when its chief executive Alan Watling resigned after just 3 years of running the company. Watling brought industry respect and experience to the company. Timis says he will step in as CEO until a replacement can be found. The company’s overall stock value has gone down by 4 percent when it reduced its 2012 outlook. Little or no care for the elderly in Sierra Leone, shouldn’t they get free healthcare too?